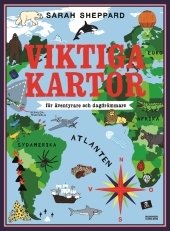 Around the world in 40 pages - for adventurous and daydreaming identify travelers at home on the sofa! Who doesn’t dream of finding an old map with a cross marking the treasure and then sailing away towards the golden sunset? Sarah Sheppard gives us palpitations when she describes all the amazing, exciting and mystical things that we can discover on our own planet. With this atlas in your hand, you can travel anywhere in the world, in your imagination. In no time! Where can you go to experience volcanic eruptions, solve strange mysteries, find precious stones or climb the highest mountain? Here are the answers for the adventurous! But this is also the book for the more cautious, the ones that want to avoid swimming with crocodiles in the Nile. After reading this book, you've got to experience real adventure in a safe manner. And know where you absolutely do not want to go. Besides theme maps such as "Mysterious Places", "Dangerous Animals", "Deep Sea" and "Gold and precious stones" are also flags and maps of countries and capitals. Winner of the "Carl von Linné-plaketten", the award is given annually to the person who writes last year's best non-fiction book for children or young adults.